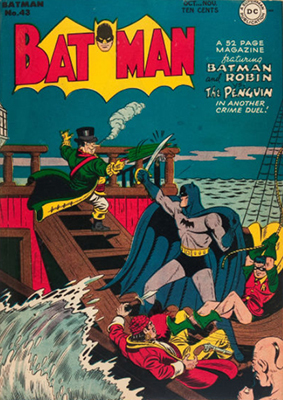 The Penguin vs Batman. Again. 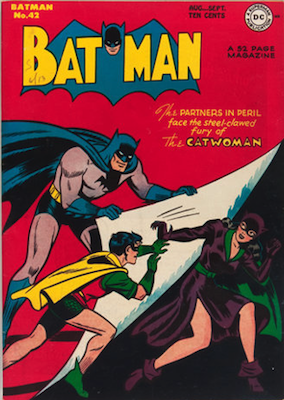 Catwoman returns with a new costume and appears for the first time on the cover of Batman. Va va va VOOM is all we can say. And more Penguin action. 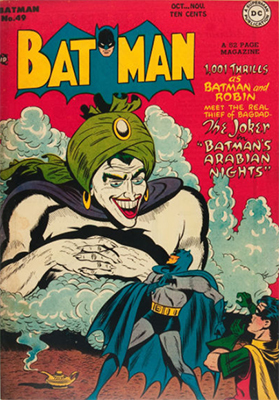 Did you know he was Batman's "drollest opponent"? 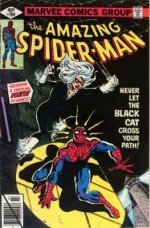 Another Catwoman story. Never a bad thing! 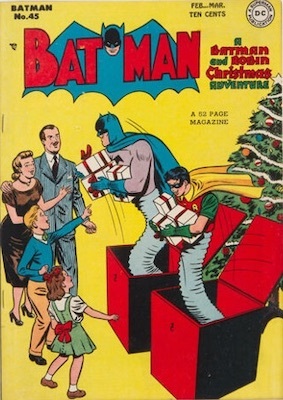 Christmas cover. 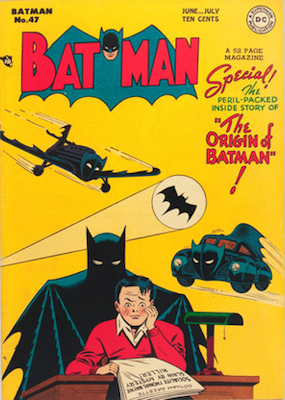 What's most interesting about Batman #47 is the further development of Batman's origin story. 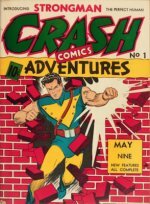 Joe Chill is murdered by some thugs, angry that he "created" Batman by killing his parents, luckily before he can tell them Batman's secret identity (which Batman has, for some reason, decided to tell him). 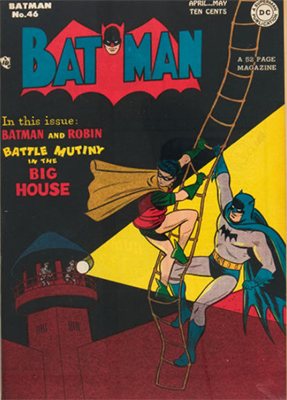 In the course of the story, we see the murders of Thomas and Martha Wayne in greater detail than ever before. It's compelling stuff. 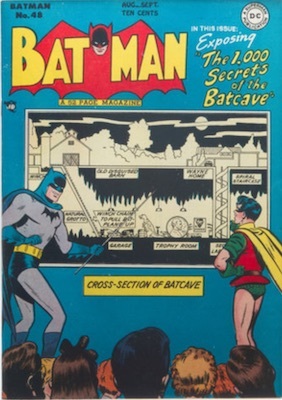 Classic cover story, "The 1,000 Secrets of the Batcave". Great Win Mortimer cover. 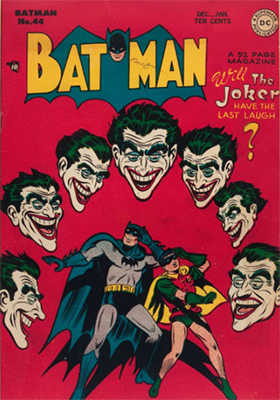 The Joker is on the cover, but Batman #49 features the debut and only Golden Age appearance of Jervis Tetch, aka the Mad Hatter. He commits hat-based crimes, you see? Arguably more important is the first appearance of Vicki Vale, the one-time Bruce Wayne love interest, played with extra va-va-va-voom by the not-yet-crazy Kim Basinger in Tim Burton's 1989 Batman film. 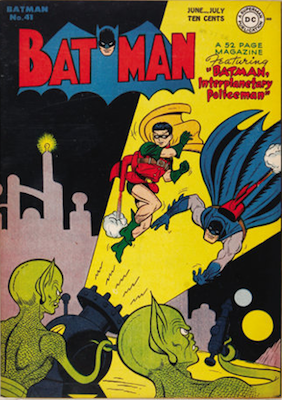 Bob Kane supposedly modeled Vicki's anatomy after a young Marilyn Monroe. 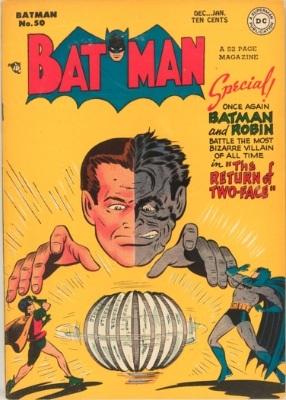 Two-Face appearance, when he was still Harvey Kent.